My oldest son has become quite infatuated with gardening. It all started when the first flowers started appearing at stores in our area and he got the idea into his head that mommy needed to actually plant something this year. Now I always have the best intentions with my gardening, I have a garden bed and great pots for my porch. The first three years after I had my oldest son I always had a great garden and my flowers were always beautiful. Then I had my second son and all my gardening seemed to fly out the window. I grew up with a mother who seemed to be able to grow anything she touched. We had the most beautiful lilac trees that people would ask permission to pick from every year and her tomatoes were always juicy, big and delicious. I have somewhat inherited this green thumb. When I actually get around to planting my garden for the year, it always looks fabulous. Emphasis here is on actually planting the garden. So this year, I actually went out and bought soil, plants and with the help of my three and six-year-old I planted a very nice garden and flower pots are spilling over my porch. They do look very nice and my oldest son is so proud of himself. So much so that today when we drove to the farmer's market in Charleston my son came home with more flowers that he had personally picked out for the porch. In addition to all the gardening supplies we additionally brought home a great bunch of new vegetables, dried beans and spices that I am never able to find in my city. I love shopping at farmer's markets and my two kids have grown to love them also. Cauliflower is one of my kids favorite vegetables to buy and cook from the farmer's market and grocery store, so I was eager to try the recipe for Sicilian Cauliflower Pasta in the March issue of the Food Network Magazine. This recipe has 11 ingredients. It takes 30 minutes of total time, 20 minutes of which is active and makes 4 servings. I had no problems finding any of the ingredients at my local grocery store and I made no ingredient modifications. I allowed my cauliflower to cook much longer than the four minutes suggested by the recipe in order to be sufficiently browned. Additionally, I allowed the pasta to cook with the dill mixture for approximately 5 minutes in order for the pasta water to fully absorb and the flavors to be enhanced. I followed the remainder of the recipe as written. I try to keep my reviews as realistic as possible and this recipe I am sad to say did not live up to expectations. 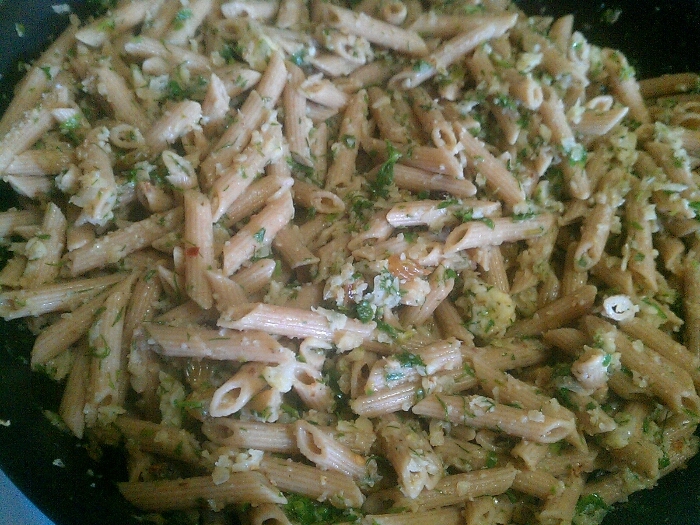 The flavor was bland and the whole wheat pasta when combined with the parsley was way too gritty. So here are my suggestions to save this dish. First and foremost use regular pasta instead of whole wheat. The whole wheat pasta, while better for you does not work with the cauliflower and dill in this recipe. The combination of textures is way too gritty. Second, I would suggest roasting the entire head of cauliflower in the oven at approximately 400 degrees until well browned (about 20-30 minutes). Then chop the roasted cauliflower instead of grating and pan frying like the recipe. Finally, I would eliminate the parsley completely and add capers for flavor. I would also increase the amount of cheese to a 1/4 of a cup and double the amount of golden raisins. I think with these changes this recipe can be significantly better and has the potential to be a great dish. 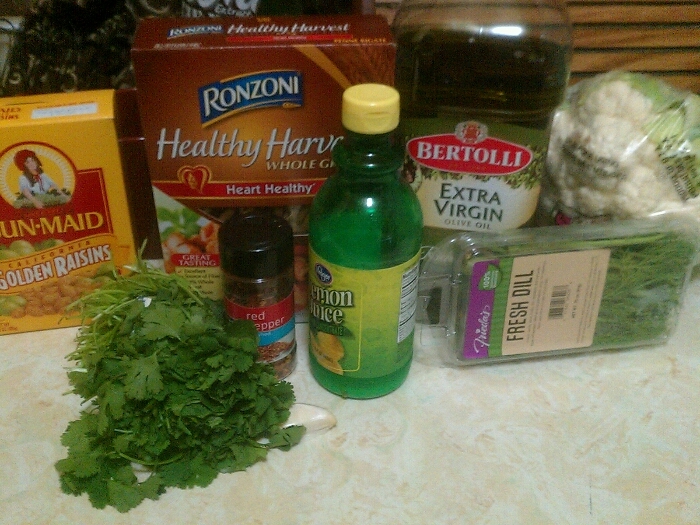 For the recipe go to Sicilian Cauliflower Pasta. Thanks for the sweet comments :) My family wasn't found of the whole wheat pasta, but with modifications the recipe could be great! Perfect 30 minute meal. I love it. Thanks :) I love making pasta it really is easy and very versatile. Going over to check out your blog now! Found you through 99% exposure blog hop! Your newest follower...please follow back. Thanks for stopping by my page! I'm following you back. All this food looks so yummy! Thanks for the sweet comment :) Come visit again soon! Thanks, I hope you come back again soon and find some new recipes to try! Pasta looks great. Kudos to you for having boys who like cauliflower. Met you through the Making Your Morning hop. Your site is delicious. Thanks for the sweet comment! Checked out your blog, it looks great!